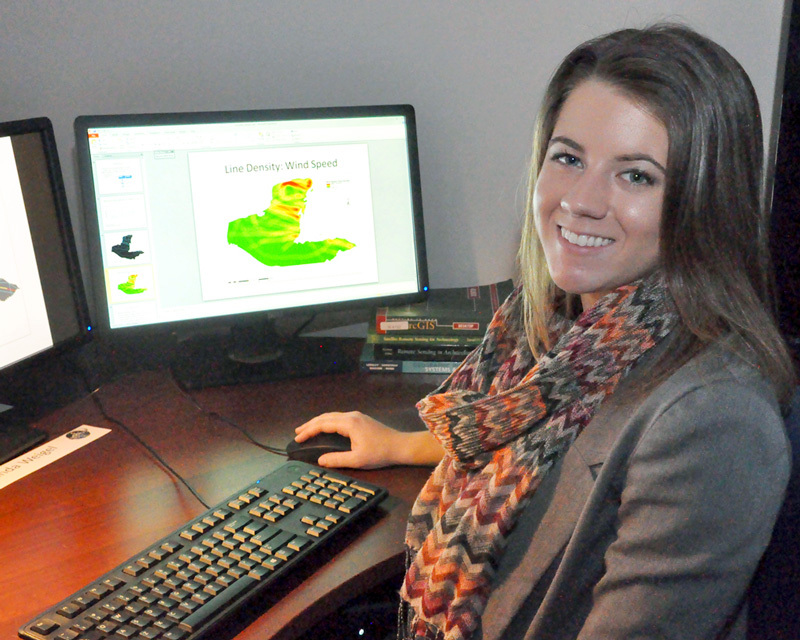 The Federation of Earth Science Information Partners (ESIP) awarded the 2016 Robert G. Raskin scholarship to Amanda Weigel, a graduate student in Earth system science and Research Associate with the Global Hydrology Resource Center Distributed Active Archive Center at the University of Alabama in Huntsville’s (UAH) Information Technology and Systems Center. Weigel’s research focuses on geospatial modeling of natural hazards and land-atmosphere interactions in tornado genesis. Weigel was involved in the NASA Marshall Space Flight Center’s (MSFC) work on the White House Office of Science and Technology Policy led Climate Data Initiative project, where she supported the collaborative development of data models and a faceted classification scheme for the Human Health theme. She also supports NASA/MSFC’s Data Science and Informatics Group ongoing research to design knowledge graphs that improve the search and discovery of data and resources within atmospheric science. Weigel has received funding from the NASA DEVELOP Program, the UAH Master’s Competitive Internship Program and the UAH Industry/University Cooperative Graduate Student Research Program. She plans to pursue a doctorate in atmospheric science to blend her experience working in atmospheric, data and geospatial science. The Raskin Scholarship is an annual award made by ESIP to a current graduate student or postdoc in the Earth or computer sciences who has an interest in community evolution of Earth science data systems. The scholarship is named for longtime ESIP member Robert G. Raskin, and seeks to promote collaboration, research support and exposure for talented students. “Amanda’s diverse skill set and research experience have given her unique and valuable insights into the needs and uses of Earth science data. Her interest in interdisciplinary research and her passion for promoting collaboration among Earth science professionals align well with the mission of ESIP. I’m ecstatic and pleased that she is the recipient of this year’s Raskin scholarship,” said Emily Law, ESIP President. Weigel will receive a stipend and travel support to attend the ESIP biannual meetings; she will also give an invited talk at the July 2016 ESIP meeting in Durham, North Carolina. The Federation of Earth Science Information Partners (ESIP) is a community of innovative science, data and information technology practitioners. ESIP members catalyze connections across traditional institutional and domain boundaries to solve critical Earth science data stewardship, information technology and interoperability issues. Through this work, ESIP improves Earth science data management practices and makes Earth science data more discoverable, accessible and useful to researchers, policy makers and the public. Learn more at esipfed.org or follow @ESIPfed on Twitter.